We were sitting in a field of sweet corn in Minnesota in the late summer of 2013. A pile of 200 husked and partially eaten ears of that same corn sat at our feet. After tasting that many ears of sweet corn in one sitting, most people would swear off the traditional flavors of summer for good. But not the two of us: A couple of graduate students studying to become classical plant breeders. Along with our collaborators, we were particularly excited that day. We had been selecting and improving this particular open-pollinated organic sweet corn since 2008. We did this using a method called participatory plant breeding. 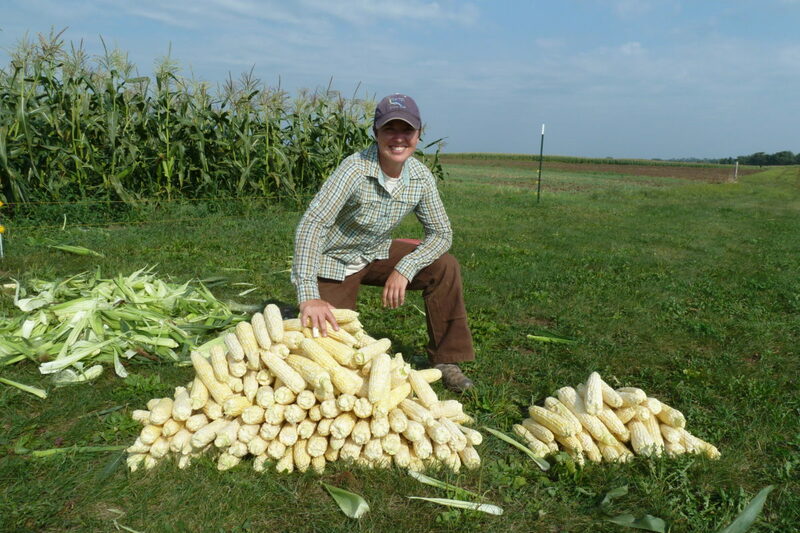 In this case, public breeders at the University of Wisconsin-Madison collaborated with organic farmers and the non-profit Organic Seed Alliance to develop sweet corn that thrived in their farming systems. Because they do not depend on synthetic fertilizers and chemical pesticides to ensure that their crops reach the harvest stage, organic farmers must work with biological processes–such as beneficial soil micro-organisms and natural plant disease resistances–to raise healthy crops. It is our job as breeders to develop varieties that thrive in these sustainable farming systems. Not surprisingly, most plant breeders work for private seed companies and are developing varieties for the much larger market of conventional growers. But organic farmers want their own seeds. So do others using sustainable farming practices that focus on regional food systems. They can especially use varieties that have been specifically bred to take advantage of fertility sources, such as compost and green manures, to out-compete weeds through rapid germination and plant architecture, and to naturally resist diseases and pests. These farmers have the potential to increase their yields and decrease their labor costs with improved varieties that have been adapted to their unique farming systems. Although organic is the fastest growing sector of the food industry, organic cropland only comprises one percent of total farm acreage in the United States. Public plant breeders based at land-grant universities are in the best position to address the needs of these growers. With adequate funding from the United States Department of Agriculture (USDA), public breeders can develop improved varieties that will play a crucial role in moving our agriculture towards a more sustainable model. And as graduate students in the Plant Breeding and Plant Genetics program at the University of Wisconsin-Madison, we are eager and encouraged to participate in this new wave of public breeding for sustainable farming systems. This week, we’ll travel to Washington, D.C., to present our research at the 2014 Seeds & Breeds Summit for 21st Century Agriculture. The summit, hosted by the Rural Advancement Foundation International, will focus on the theme: “Meeting the Challenges of Food Security.” There we’ll talk to federal policy makers, farming advocates, and farmers about seed breeding. As part of a cohort of graduate students from across the country, we are among the next generation of plant breeders who is looking to re-engage the public plant breeding sector, to form new collaborations across public, private, and non-profit sectors, making agricultural more sustainable along the way. But to achieve this vision, we need public funding for seeds at the land-grant universities. A vibrant food system must look beyond the food that travels from the farmer’s field to the eater’s fork, and recognize that it all begins with resilient and diverse seeds. I wish wish you much success in keeping organic varieties alive! I respect & uphold your convictions on this matter which is so dearly meaningful to me. I descended from farming ancestry on both side of my parents in the generally agricultural-based communities of a 3rd world country. Me & my 6 siblings thrived on produced from our family farms & other farmers on nearby villages & towns. Whether it were vegetables, fruits, herbs, meats, chicken & eggs, all were produced locally. We delighted ourselves upon the sweet taste of fresh produce & the aroma & fragrance of unadulterated tomatoes & herbs. The farmers including my father and my grandfathers before him were not rich but they were healthy & happy and expected a longer productive life (my father is still alive and well at age 90). Me & my siblings have left the farm life and established ourselves on far away so-called technologically-advanced world. Every time I visit my town-of-birth, my heart bleeds hearing news that young farmers or their sons & daughters are wasting/dying away of some eerie-kind of lung or kidney diseases that they could never understand. The farmers are also complaining that their once productive lands could no longer produce enough to sustain them, And to make matters worse, they have become even much poorer owning seed & fertilizer dealers more money than what they can produce. They were lured into planting supposedly "special seeds" (unbeknownst to them were Genetically Modified seeds) that they were told would yield more & they were sold fertilizers & herbicides to go with the "special seeds." These farmers trusted these middle men but after just few years, they feel the harsh consequences of that trust; unknown illnesses, decreased yield, inedible produce & worst, early death! They had been betrayed and they are now clamoring to use and plant their original unadulterated crops. This is where I would like to help them and I am talking about just a small town (my birthplace) for starters. I would like to know how I could procure the seeds produced by your study to introduced to a small number of farmers, mostly my fathers relatives. I probably am not ready to subsidize the needs of the whole town but I would very much like to subsidize a few farmers who are still very much close to my father. In reality, my father still lives in the house, in the same village where all of his 7 children were born. He is still in daily contact with the sons & daughters of his farming friends. For now, because he has gone totally blind (due to retinitis pigmentosa) he helps them by loaning whatever funds he has and in return they take care of him. He had fiercely refused to come & stay with us here in the USA because he said, his soul needs the farm to thrive & survive! Now, you know, how dearly this matter means to me. I would like to give back to my community; where I started and where my 90 year old father needs to thrive.